2014 was unique in its way; Sharp drop in oil prices, Russian annexation of Crimea, World cup soccer, Ebola epidemic, regime change in India, elections in Brazil, power shift in the congress and finally positive ending of S&P 500. Though market was started with rumble in the year 2014, it ended with humble 13.69% return beating 83 percent of large blend mutual funds. Last year our winners in the portfolio were Southwest Airlines, Spirit Airlines and Berkshire Hathaway; Google and Holly Frontier were our laggards. As we predicted consolidation in oil refiners that has not materialized. We believe Holly Frontier has properties at strategic locations and has excellent cash flow trading at lower multiples yielding nearly 10 percent with special dividends; could be an easy acquisition target by bigger oil firms. Though Google had lackluster year in 2014; new product innovations, market leadership and lower price multiples will improve Google price in the year 2015. We are still holding both Holly Frontier and Google. Also last year our Long term value portfolio returned 15.1% net of fees versus S&P 500 realized 13.69% with dividends included. Year 2015 is going to be very interesting year due falling commodity and oil prices, lower unemployment rate, strengthening dollar, lower trade and lower fiscal deficits and wage inflation and possible interest rate hikes. At the beginning of this year all leading economic indicators are showing positive trend. Uptrend in average weekly hours, decline in initial unemployment claims, expansion in manufacturing with new orders and steepened yield curve among the all major economies is very good beginning. As we predicted in the last year’s review (http://investing.covestor.com/2014/01/2014-trends-watch-oil-glut-airline-oligopoly) there was so much inequilibrium between oil supply and demand. Recent oil correction is well deserved and shot in the arm for many global economies. It all started when we waged two-pronged war in the Middle East. Oil prices spiked up due to fears of supply constraints, though they never realized. Oil prices drastically moved up from $26 a barrel in January 2002 to $143 in July 2008 right before the recession. It was a startling gift to oil producers while domestic consumers were squeezed hard due to oil price spike. Oil producing countries including OPEC nations enjoyed surplus wealth due to higher oil prices. Unfortunately ones pain was others gain. However technological innovations in shale oil extraction, slack in global oil consumption, advances in energy efficient automobiles and electric vehicles reversed the oil price trend. We have started producing more oil domestically than importing from the foreign markets. Eventually glut in the oil supply made its magic in the market. Finally we are at a stage that we don’t need to worry too much about exogenous shocks related to oil on our economy. How low these oil prices can go? All these boom days’ oil producing countries highly relied on oil wealth and never able to diversify their economies. They spent their excess wealth mostly on public spending, oil subsidies and wage increases. Prior to 2015, most of the energy rich nations prepared their fiscal budgets looking backwards. In order to balance their fiscal budget the price of the crude oil needs to be at above $100 for the oil rich Middle Eastern nations. 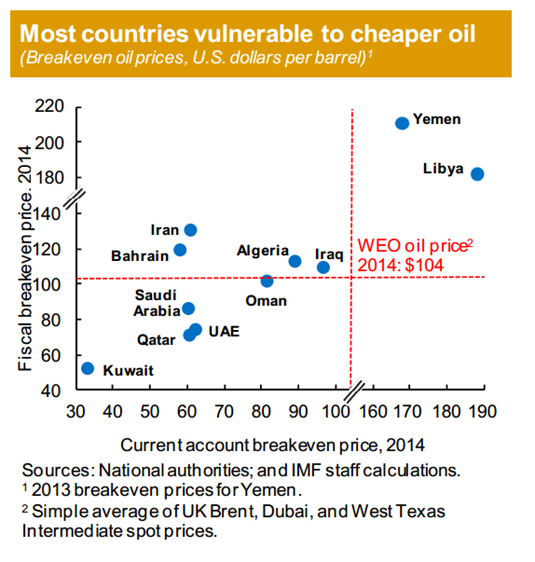 As you can see in the above IMF chart the breakeven prices are ranging from $55 for Kuwait to $180 for Libya to balance their fiscal budgets. At this crude price $55, are these Oil supplying countries able to cut their oil production without dipping into their sovereign funds or cutting spending abruptly without any domestic turmoil? I seriously doubt it. The next stop for oil is below $50 or even at the $40 range? How much impact lower gasoline prices have on the economy? As per AAA average gas price average gas price per gallon last year was $3.301 and as of now the average gas price is $ 2.168 that is $1.133 cheaper than last year. As per BLS in 2013 average family spent $2418 on gasoline that is average family consumed 616 gallons of gasoline. Out of 126 million households we consumed 78 billion gallons of gasoline. With $1.133 gasoline price drop the impact on our economy is $90 Billion ($87,708, 611,760). If we add jet fuel and diesel from industrial consumption the impact on our economy is tremendous. 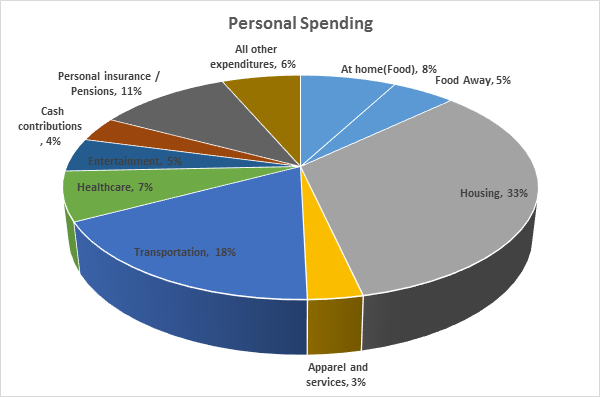 Eventually all these saving this will add up on lower cost of goods and higher consumer spending and there by significant impact on out GDP growth in 2015. Some of the economists arguing that capital expenditures from energy companies will decline in 2015 due to lower profits may have negative impact. We believe overall net gains from consumer spending has lot more impact on the economy than reduction in oil industry capital expenditures due to the fact velocity of the money at consumer level is lot higher than capital spending by big firms and also oil industry expenditure is not all spent within the boundaries of the country, and third of our energy consumption is from abroad. Who will benefit from energy savings? pump will be spent on consumer staples than luxury items. In our opinion excess marginal spending will benefit grocery stores like Wal-Mart, Costco, Kroger and SUPERVALU. Next level of beneficiaries are casual restaurants like Panera bread and Starbucks café. Other big winners are going to be in the transportation industry particularly corporations like FedEx and Southwest airlines. What we see year ahead? At recent survey at Barron’s magazine market seers on average predicted 8 percent return on S&P 500; however we believe this year we are expecting S&P 500 return will be higher than last year returns. We see lot of tail wind to our economy due to decline in energy prices and accelerated consumer spending and real wage growth which is stagnant for the long time. deficit simply due to energy prices. Whereas Korea and Germany have highest percentage of their GDP tied to exports will face headwinds due to global slowdown. Other end In US our exports contribute only 14 percent of our GDP, global weakness have little impact on us in the next year. However many multi-national firms face headwinds due to stronger dollar and weaker global markets especially in Europe. Airline industry will have another exceptional year (third in a row) due to lower competition in the domestic market and lower oil prices. However this year all airlines may not end up winners. Open air agreements with foreign carriers bringing heavy competition to major carriers in the trans-Atlantic market from gulf airlines. That will put price pressure and vigorous competition among airlines. Almost all airlines charge for luggage and some even charge for carryon bags. All the major airlines cutting loyalty miles for economy class travelers. Only exception for all these trends is Southwest airlines. It has adopted exceptional customer service and follow egalitarian approach with single class of seating and never charge for bag fees. That is the durable competitive advantage. Southwest is also expanding its services to Caribbean and Mexican destinations and going to start direct international service from Houston Texas. Other airlines to watch is Copa airlines based in Panama. A well-run company dominant in the Latin America flies to most of the Latin America and North America has partnership with United Airlines Star Alliance trading at lowest multiple generating abundant free cash flow. We also foresee 2015 is going to be the last year for Sears and Radio Shack companies. Their cash burn rate does not justify their existence any more. With same kind of high cash burning rate, sooner or later JC Penny may also join the cliff jumping party. With ubiquitous cheaper internet data plans, 2015 is going to be a remarkable year for cloud players. All new personal computers, tablets and electronic devices will come with thin hard drives and heavy cloud drives. Eventually cloud storage players like Google, Apple, Amazon and IBM take major chunk of consumer business. Finally we see Apple pay will be adopted by all mainstream retailers. If Apple can bring department of motor vehicles in their customers list, there is no need to carry our wallets because you have your driver’s license, insurance card and all electronic cash stored in the Apple phone. Ok Now Alibaba is started trading at around $91 and Yahoo started trading down at around $41. Being 22% share holder of Alibaba, Yahoo supposed to get all the benefits of Alibaba ownership. Why market is trading Yahoo downwards? How much Yahoo is truly worth after Alibaba IPO? Yahoo owns 523 million Alibaba shares or 22.4% of Alibaba. At $90 Alibaba trading Yahoo’s ownership itself worth $47 billion; after paying whopping 35% tax it should be valued at $30.5 Billion. Yahoo owns 35% of Yahoo Japan. At current market value its worth is $7.7 Billion; again after paying 35% tax its worth is $5Billion. Yahoo has $2.74 Billion cash on its balance sheet; for the past twelve months Yahoo made $1.26 Billion on earnings. At twelve times past earnings estimated Yahoo value is at $14.7 Billion. If we sum all the parts Yahoo value is way over current trading price. Let’s say if you want to ignore earnings metrics and adopt conservative 8 times trailing EBITDA ($1.28 * 8) is at $10.24 billion that puts Yahoo fair value at $ 44.40. Also every dollar change in Alibaba worth $0.34 for Yahoo on after tax basis. Again this is conservative approach on Yahoo valuation. Yahoo can play Alibaba stake at much tax efficient way such as spinning of Alibaba stake into different entity and allocating new entity shares to shareholders. Yahoo brand itself worth lot more; if someone wants acquire entire Yahoo, Share holders demand much higher price than it is now. What is the intrinsic value of Yahoo ? There is lot of discussion about Yahoo and Alibaba (BABA) IPO. As of today (Sept 10th, 2014) Yahoo closed at $41.14 and has 994,600,000 outstanding shares, trading at market cap of $ 40.917 Billion. Alibaba is going to IPO at price range of $60 to $ 66, let us say $63. Yahoo owns 35% of Yahoo Japan. As of now Yahoo Japan Market cap is 2.363 Trillion Yens; at 106.83 yens for US dollar it is equivalent to $$22.122Billion. Yahoo’s share at 35 % rate worth $7.73 Billion. Yahoo earned trailing twelve months $1.226 Billion. At Conservative 12 times earnings its value should be at least $14.713 Billion. Share price value should be $55.71. So upside potential for yahoo is approximately $14 or you can say there is big margin of safety if you own Yahoo share at this price. Assumption here is Alibaba trades on IPO date at $63. Again this theory, in reality there is always gap between theoretical price and actual price. Disclosure: I own both Yahoo stock and derivatives. Do your due diligence prior to committing your hard earned money. The first quarter of 2013 was a positive one for stocks. The S&P 500 Index(SPX) returned little over ten percent in the first quarter. We believe part of that can be attributed to relative calm atmosphere in Washington and part of it to modest global economic growth. The unemployment rate declined and now stands at 7.6% from the peak rate of 10% in October 2008. 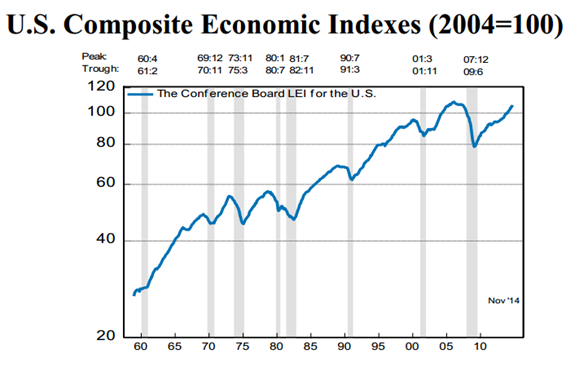 The U.S. economy is showing strength year over year and GDP is moving up, but at slower pace. Early baby boomers reached their retirement age during 2007 and the pace of their retirement is accelerating. We believe this demographic trend will have a significant impact on the economy. On the positive side, more jobs are available to young workers; but on the negative side there will be big vacuum of skilled labor also more entitlements need to be paid to these young retirees. Short term interest rates have been at near-zero levels for quite a few months and long-term interest rates are at historically low. The U.S. Federal Reserve is buying long term bonds and keeping long term rates artificially low. The housing sector is exhibiting pockets of strength due to low levels of inventory, lower mortgage rates and higher rental prices. Long-term rates have moved down in tandem in the Western industrial nations, including the USA. Long term rates generally depend on short term rates, expected inflation and market participants’ demand and supply. Currently the Fed’s accommodative monetary policy is keeping real interest rates low, but as employment numbers get better, We believe disposable income and discretionary spending will go up. In our opinion, that will put pressure on inflation and Fed should start raising interest rates. Sooner or later, the Fed will stop buying long term bonds and long-term rates will start creeping up in our opinion. Biggest concern right now is that with bond investors looking for higher yields, they will buy lower quality junk bonds. Probably the prudent thing to do we believe at this point is to refinance mortgage loans and lower the duration of the bond investments; in other words, in our opinion investors should increase short-term bonds in the portfolios. At the end of the first quarter, our portfolio trended up along with general market. Going forward, we believe the market should go up more from these current levels as more funds start moving from precious metals like gold and bonds into equities. As of now, we are fully invested in the market and may not make any significant changes to our portfolio. The following letter to covestor wriiten on October 4th and published on October 27th. Recently, the Fed announced a new monetary policy (QE3) in which the central bank will buy mortgage backed securities and start pumping money into economy. This aggressive monetary policy keeps long-term rates low and may spur activity in housing sector. But with sagging unemployment levels, I doubt how quickly housing sector can bounce back. Once bitten, twice shy. With recent bad memories, bankruptcies and foreclosures, I suspect the public will respond very slowly to the housing sector even though there are hundreds of houses on the market at rock bottom prices. So will the banks, as they are still cleaning their balance sheets from a glut of unwanted properties. I would rather credit the foreclosed property investors for the recent uptick in the housing sales than the general public. There is a wonderful book “The Wall Street Waltz” written by Ken Fisher (Forbes Columnist) on real estate cycles. In one of the chapters in his book he concludes from 150 years of data, that real estate prices go through cycles like any other economic cycles. According Fisher, from the peak of the real estate cycle to trough is around nine years and from trough to peak is nearly nine years. Let us assume if the real estate peak was in early 2007, then the bottom of the real estate market may not be until 2016. If you think this time is different and the Fed is easing its monetary policy, there may still be few more years to go to reach the bottom of the real estate market. There may be pockets of strength in real estate, but I won’t rush to invest in home builders and other real estate related companies. Caveat Emptor. The biggest event in the fourth quarter is presidential elections. And by end of the year, the Bush tax cuts are going to expire. Long term capital gains tax rates are going to go up from 15% to 20%, and if your annual income is above $250,000 there will be 3.8% surcharge on capital gains. Dividends will be considered as ordinary income. Market participants may not wait until the election results. Some of them may adjust their portfolios and realize capital gains this year rather than waiting until the last minute. Some companies may even declare one-time cash dividends before the end of the year. In my opinion fiscal policies, including reduction of fiscal deficits, may do more to dictate future economic recovery than just changes in taxation or relying on monetary policy when interest rates are at zero percent. Oversupply of money into the market may benefit in short run, but will have painful consequences in the long run once inflation picks up speed. For years Amazon.com (AMZN) has enjoyed a tax exemption on its online sales. From September 15th onwards the state of California joined Texas, New York and other five states in imposing sales taxes on Amazon online sales. The combined population from all these eight states is more than third of the national population. Next year New Jersey and few other states start collecting taxes from online sales. The well anticipated tax change can keep companies like Wal-Mart (WMT) is competitive edge with online retailers like Amazon, and may give second life to lone brick and mortar book companies like Barnes and Nobles and electronics retailers like Best Buy (BBY). But it certainly helps many big retailers like Wal-Mart. If the unfair tax advantage is eliminated people may tend to buy at brick and mortar retailers like Wal-Mart due to free shipping to nearest retail location for pickup and for convenience of sales returns. Last month the Indian government eased restrictions on foreign retailers; Wal-Mart is now spreading its wings into the Indian market through joint ventures. Twenty nine percent of Wal-Mart’s revenue comes from international sales and revenues at international segment and are growing at a 15% rate, according to a recent earnings statement. Wal-Mart has about 5,800 international retail stores; out of that Wal-Mart has only fifteen stores in India. The potential to serve more than billion customers in Indian market is tremendous. Wal-Mart financials look impressive and can weather both tough and good times. Recently I included Wal-Mart into my portfolio. I am a long term investor and most of my funds tied to assets are held for long term; however last quarter I have made few quick runs when short term opportunities with relatively less risk have arrived. Also I adjusted last few days of the September to protect the capital and to address my perceived volatility of the fourth quarter of this year. Finally, as of October 4th, I have completed two years of managing the Long-Term Value (LTV) portfolio. In two years the cumulative portfolio return was 45.2% (net of advisory fees) versus 27.6% return of S&P 500 (excluding dividends), that is annualized returns of 20.4% (net of advisory fees) versus 12.8% on S&P 500 return. Year to date, LTV portfolio returns were 26% (net of advisory fees) versus 15% on S&P 500. Straddle is a strategy you use it when you do not know the direction of the stock price. In straddle you buy a call and put at the same strike price. It’s a bi-directional trade. Here I am going to demonstrate how you can use straddle and make a trade of it using Groupon Options. 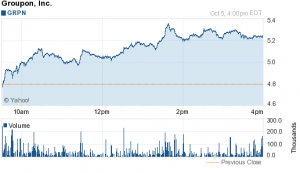 On Friday October 5th Groupon (GRPN) closed up at $5.25. That is $0.45 or 9.37% price change in one day. The trading volume on Friday was 18 million versus daily average of 12 million. 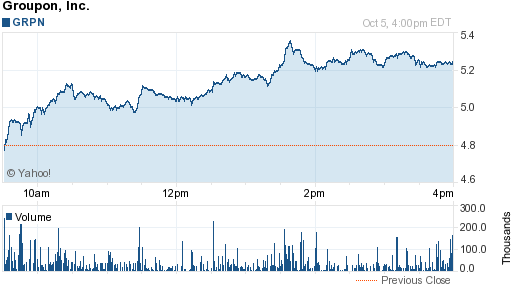 Groupon quarterly earnings are coming on October 11th. I do not want to speculate what happens to the stock right after the quarterly results. However there is lot of pressure on internet companies to show the profits and justify the valuations. Groupon has market cap of $3.4 Billion and has negative earnings of 12 cents per share in the last trailing twelve months. There is tremendous pressure on Groupon to show the great earnings numbers or else market is going to treat it really bad. If the earnings beat market expectations stock may go up really good or tank really bad if earnings numbers are bad. Here let’s look at the option prices on Groupon to make a straddle .Generally, to create a straddle you buy both calls and puts at the money. Since Groupon is trading $5.25, we buy little out of money calls and puts. That is October 5.50 call and 5.00 put. In this case both these calls and puts are trading at $0.25 each, so the straddle is going to cost $0.50. Or you can also interpret market participant are expecting at least ten percent of move after release of quarterly results. In this straddle, there are two breakeven points, one at when stock is trading above $5.75 other at below $4.75. After earnings, If the stock does not move and stays at exactly at $5.25 both your call and put options loose value. 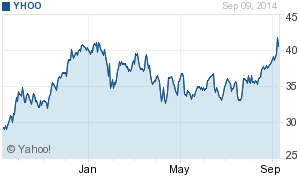 Given the volatility and market expectations on Groupon the chances of staying at same price is relatively low. Same time if stock goes to zero, your put price will be valued at $5.25 and your profit will be $4.75 which may not happen or if stock goes really high your potential in call is unlimited. These are theoretical and exaggerated case scenarios. But given the market conditions and expectation on Groupon’ s earnings, there is greater chance that Groupon can move more than 10 percent in any direction and this straddle may end up in profit. There is also another scenario, volatility can play bigger role in straddle. Since earnings are few more days away, there may be last minute rush. Many more market participants and speculators may enter into the trade to buy calls or puts that makes implied volatility to go up prior to earnings day. That is good news if you buy straddle on this stock. Volatility increases both call and put prices, you can even exit the straddle by selling your overvalued calls and puts right before earnings and can make quick profit. Remember, straddle strategy is speculative bidirectional trade and you must be experienced in trading options and understand the risks associated with. I already own straddle on Groupon.